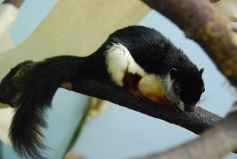 The Prevost’s squirrels are black on the upper portion of their body. Their under portion of their body is reddish-orange while their thighs and flanks are white. They are a diurnal and arboreal species only coming to the ground to forage occasionally. They build nests in trees out of plant material. They live solitarily and females give birth to one to five young. Conservation: Although the species is found commonly in many protected areas, a substantial percentage of their native habitat is being converted to plantations which could have an adverse influence population numbers in the future.